“Amongst all the planning, don't forget to factor in quality time with your friends and family. Find photographers that become your partners in crime during all the festivities because they're the ones following you around all the time!“ – Dipika. Scroll down to see the most special moments from this love-filled cross-cultural destination wedding! Wedding celebrations began with the Shagun, an age-old Hindu wedding tradition where the groom’s mother visits the bride’s home with gifts in the form of blessings, literally translated into shagun. 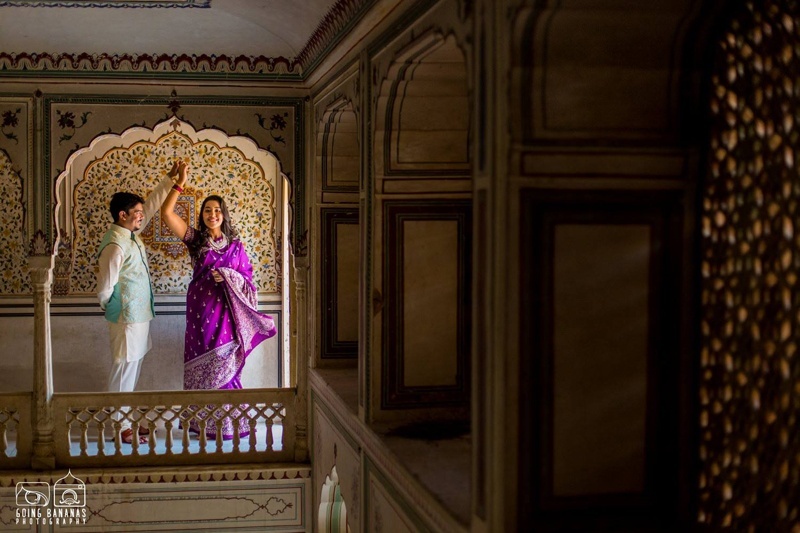 Since Rudro and Dipika opted to have a royal destination wedding, their Shagun happened in the courtyards of Chomu Palace, Jaipur. Dressed in an eggplant purple saree, Dipika looked simple, yet beautiful. Minimal jewellery and minimal makeup were beautifully complementing those bold paisley weaves. Rudro donned an outfit which was perfect for the outdoor marigold laden Shagun they were having. His off-white kurta pyjama paired with a fully embroidered ice-blue Nehru jacket – brilliantly dressed couple goals anyone? The courtyard of Chomu Palace, Udaipur was decorated with an abundance of fresh marigolds in hues of orange and yellow by decorators, Anju Mahesh, Jaipur. Dipika was dressed in a beautiful day-time fuchsia and aqua lehenga choli with pretty-pretty minimal floral jewellery that had us day-dreaming of Bipasha Basu from here #MonkeyWedding. The pani-puri / chaat waala was a brilliant addition to their bright, sunny outdoor mehndi – afterall, what’s more satisfying than filling your tum with a plate of sweet-spicy golgappe! This personalized sangeet ceremony topped with truck-loads of fairy lights was a pefect setting for the dance-filled night that was about to commence. To add to their purple and yellow themed sangeet, Dipika wore a canary yellow anarkali from Bubber Couture with a contrasting cobalt blue dupatta and minimal gold jewellery, while Rudro looked dapper in his carbon black jodhpuri suit. The glistening fairylights, pinwheels and baby photos of both Rudro and Deepika strung on white ribbon were a recipe for a perfectly whimsical night! We had to take some time out to appreciate Dipika and Rudro’s fuss-free varmala held up-high in a jharokha with beautifully scalloped edges and intricate jallies. Dressed in a beautiful red and gold lehenga from Seasons, Dipika entered under a phoolon ki Chaadar made of tuberoses. The duo exchanged red rose petal varmalas with only their parents witnessing this first step that got the ball rolling for the other wedding rituals. Dipika and Rudro celebrated their love by incorporating this beautiful colour of love into every element of their wedding. Their outfits, the wedding décor, the mandap, right down to the chair tie-backs too! Each part of the décor executed by Anju Mahesh Weddings was downright gorgeous! The Saat Pheras and other wedding rituals were held at the Swimming Pool Baradari in Chomu Palce, Jaipur : A picturesque space that lent a romantic ambience to Dipika and Rudro’s intimate wedding rituals. While Dipika went all-out traditional red and gold with her bridal attire, Rudro too matched her bridal lehenga in his dhoti-kurta from Shabari Datta, Kolkata. Usually Bengali grooms wear either a beige or white dhoti, but Rudro opted to wear a red and gold silk one to match Dipika’s ensemble. A delightful, warm hug shared between Dipika and her mother-in-law at the Shagun ceremony. Dipika trying to catch a sneak-peak of the baarat as thet enter Chomu Palace, Jaipur – the wedding venue. The uber crazy groom ready to take on the world for his ladylove, Dipika! To Book Chomu Palace for your big day at discounted rates click here!